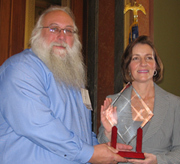 Seven people were inducted into the Iowa Volunteer Hall of Fame during a ceremony in the State Capitol Rotunda Tuesday. Vince and Judy Else of Nodaway were recognized for their Share-a-Toy program, which provides toys to hundreds of children in southwest Iowa, Missouri and Nebraska every Christmas. Vince says it all started around 50 years ago. He was teaching Sunday School when one of his students mentioned his family could not afford to buy him a Christmas present. “So I found an old toy tractor, cleaned it up and gave it to his dad. He came back to Sunday School the next Sunday and was just as excited as could be because he got a toy for Christmas,” Vince said. Ray Strekal of Perry was inducted into the Iowa Volunteer Hall of Fame for his 32 years of work for Special Olympics Iowa. Strekal is now retired, but started coaching Special Olympians when he worked at the Woodward Resource Center. “I love working with the athletes who are involved in Special Olympics…just their accomplishments and the joy they get from participating,” Strekal said. Mary Avelleyra of Fort Dodge began her volunteer service 15 years ago by assisting a young Hispanic woman who couldn’t speak English and needed help finding a place to live. Today, the 85-year-old Avelleyra provides interpretation services for a growing Hispanic population in the area. “You want to be needed, so my working with these people…they give me a fulfillment in my life,” Avelleyra said. The other new inductees include former AEGON Transamerica C.E.O. Rex Eno of Cedar Rapids, Ying Sa of Des Moines and Eric Wilson of West Des Moines. Iowa First Lady Mari Culver presented each of the inductees with an award.